Replicate a funds exposure, but on better terms (e.g. lower fees, more liquidity, no derivatives, no lock-up periods, tax efficient securities among others). Fund Cloning aims at developing a passive investable alternative to a fund hoping to gain its same exposure but on better terms (e.g lower fees, more liquidity, no derivatives, no lock-up periods, tax efficient securities among others). In its native form it utilizes a passive approach; however a clone’s risk-return balance can also be further enhanced as tracking error allows. 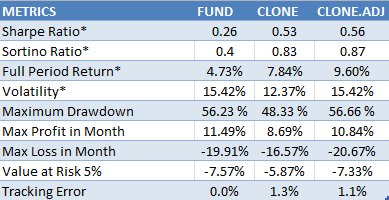 Click here to view our investable strategies developed with our Fund Cloning methodology. Factor tilting is a methodology utilized to build and manage investment strategies, based on predefined risk factors, who’s purpose is to deviate from market indices according to specific rules. Factor tilting strategies range from simple weighting schemes to more complex tilting of factors such as size, value, momentum, minimum volatility and quality, to name just a few of the more commonly known broad factors. A factor-tilted portfolio is one that is constructed with market-wide risk factors that are expected to deliver return premiums over time and under particular economic and market conditions. Cuantserv’s factor-tilted strategies rely on data-driven and economic relationships between securities and risk factors. They are created utilizing sophisticated statistical and mathematical methodologies, however, they are intuitive, transparent, and easy to understand. Cuantserv's replication toolset provides for a robust methodology for the replication of Active Equity Managers, Mutual Funds and Indices utilizing an extensive factor library. Replication can have a variety of objectives depending on the investors/managers investment style and risk/reward objectives. For example, a manager/investor may wish to replicate an index’s returns but have the specific goal of reducing volatility. Similarly, a manager may wish to replicate an actively managed fund with factors to reduce costs and improve overall risk distribution and transparency. Passive replication aims to provide a similar risk-return profile as the target investment while enhancing it in terms of risk, returns, exposures, liquidity and/or transparency. A passive replication can have various degrees of ‘passiveness’ which may allow you to accomplish multiple investment goals on a single replication. 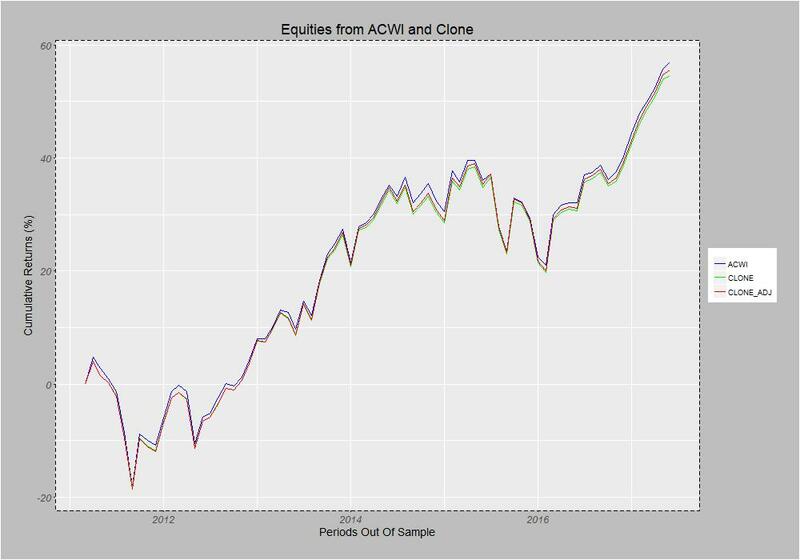 To illustrate the abilities of our replication methodology we use the ACWI ETF as the candidate fund for replication. The next example’s primary objective is to reduce tracking error using an investment universe (Exchange Traded Funds, Varying Regions and Asset Classes) which provide a client with better risk management control. This example accounts for a number of desirable features such as no short positions, maximum number of instruments and no leverage. In this example, the success of the replication was measured by more than six years of results out of sample where a tracking error of 0.26% was achieved. 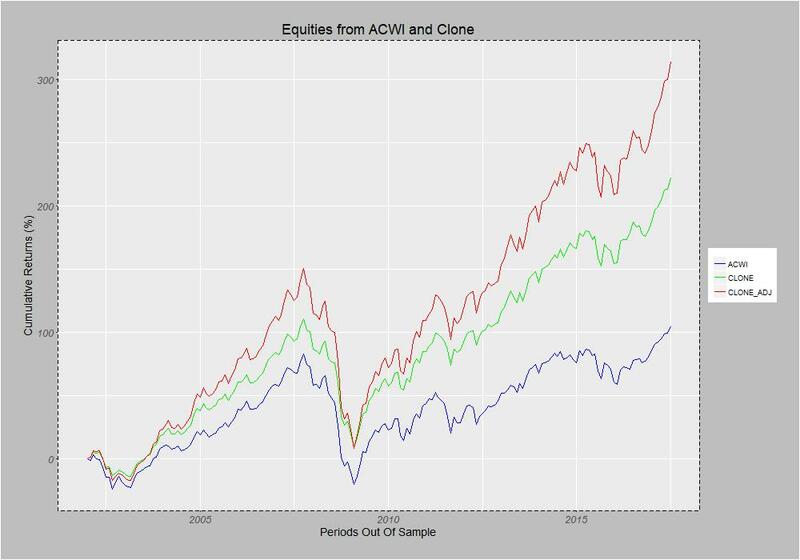 To illustrate the abilities of our factor tilting methodology we use the ACWI ETF as the candidate fund which will drive the factor portfolio weighting throughout the test period. Utilizing a proprietary tilting methodology, we aim to reduce the volatility of the source fund while maintaining or improving returns. As illustrated by the metrics table, the utilization of tilting to reduce volatility was quite successful, in addition it can be stated with equal confidence that returns were improved substantially and in particular on a risk adjusted basis.